Slapering Hol Press, 9781940646589, 260pp. TJ Dema was an Honorary Fellow in Writing of the University of Iowa’s International Writing Program, as well as Botswana's representative to the London 2012 Cultural Olympiad's Poetry Parnassus and a recipient of a Vermont Studio Centre Writers Residency. As a long-time affiliate of the British Council in Botswana, she participated in Lancaster University's Crossing Borders program and later mentored the national champions for the seven-country Power in the Voice high school program. Her poetry has appeared in journals including Sampsonia Way, The Ofi Press, and The Hummingbird Review and was translated into Chinese for the multilingual anthology No Serenity Here. When she is not writing, TJ runs Sauti Arts and Performance Management, an organization that handles arts administration on behalf of a select number of artists and writers. Her website is www.tjdema.blogspot.com. Clifton Gachagua lives in Nairobi, where he was born and raised. His first collection of poems is Madman at Kalifi (Nebraska, 2014) and he recently finished work on a novel. Clifton is also a scriptwriter and filmmaker, currently developing a French-Nigerian feature-length film. He graduated with a bachelor’s degree in biomedical science. He has spent a considerable time of his life on East African highways, travelling from lake to coast and back, in search of both love and Jeffery Eugenides’s Obscure Object. Tsitsi Jaji earned her PhD (2009) in comparative literature from Cornell University with concentrations in African, Caribbean, and African American literature in English, French, and Spanish. Her first book, Africa in Stereo: Music, Modernism and pan-African Solidarity, traces Ghanaian, Senegalese, and South African responses to African American music in print and film and is forthcoming from Oxford University Press. Her poetry has appeared in Bitter Oleander, Runes Review, InTensions and the Center for Book Arts Broadside Poetry Series. Originally from Zimbabwe, Dr. Jaji has conducted fieldwork throughout Southern and West Africa, with generous support from the TIAA-CREF Ruth Sims Hamilton Fellowship, and has been a Mellon Mays Undergraduate Fellow, a Society for the Humanities (Cornell) Mellon Graduate Fellow, and a Penn Humanities Forum Junior Faculty Fellow. During the 2012-13 year she is a Mary I. Bunting Institute Fellow at the Radcliffe Institute for Advanced Study at Harvard University. Nick Makoha fled Uganda because of the civil war during the Idi Amin dictatorship. He has lived in Kenya, Saudi Arabia, and currently resides in London. As a Spoke-Lab resident, he developed a one-man show “My Father & Other Superheroes” that reveals how pop culture raised him in the absence of his father. His poem "Vista" was used as part of a video installation to promote the Turner prize in 2008 (http://channel.tate.org.uk/media/29811526001). His poem “Beatitude” is the newest addition to Being Human, the third book in the Staying Alive poetry trilogy. He represented Uganda in Poetry Parnassus as part of the Cultural Olympiad. Makoha was one of ten writers on a program called The Complete Works, a national two-year development program for ten advanced Black and Asian poets. During the program, he was mentored by eminent poet George Szirtes. 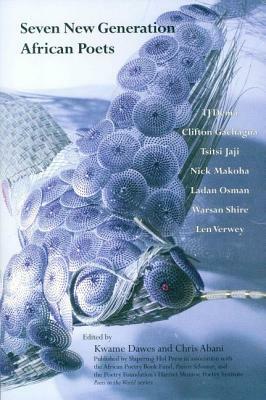 The Complete Works culminated in September 2010 with the anthology Ten: New Poets from Spread the Word (Bloodaxe Press), edited by Bernardine Evaristo and Daljit Nagra. Ladan Osman has received fellowships from the Fine Arts Work Center, Cave Canem Foundation, and the Michener Center for Writers. A 2012 Pushcart Prize nominee, her work has appeared or is forthcoming in American Life in Poetry, Artful Dodge, Broadsided, Narrative Magazine, Prairie Schooner, RHINO, and Vinyl Poetry. She lives in Chicago. Warsan Shire is a Kenyan-born Somali poet and writer based in London. Born in 1988, Shire has read her work extensively in Britain and internationally, including recent readings in South Africa, Italy, Germany, Canada, America, and Kenya. Her début pamphlet, Teaching My Mother How To Give Birth (flipped eye), was published in 2011. Her poems have been published in Wasafiri, Magma, and Poetry Review and in the anthology The Salt Book of Younger Poets (Salt, 2011). In 2012 she represented Somalia at Poetry Parnassus, the festival of the world poets at the Southbank, London. Her poetry has been translated into Italian, Spanish, and Portuguese. Len Verwey was born in Mozambique. He is thirty-nine years old and lives in Cape Town with his two daughters. He works as an economist for an African democracy organization.